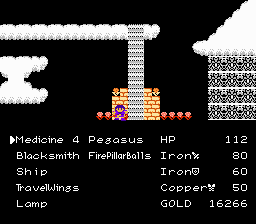 Yep, another Dragon Warrior-inspired game. Except not quite as blatant as most others. 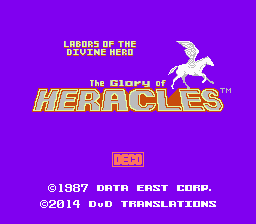 It’s in Greece, and I can only assume that you’re Heracles, but I can’t read Japanese, you see. Um, let’s leave it at that, shall we? 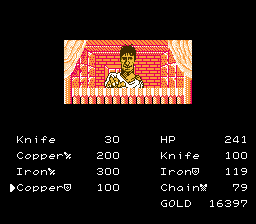 The game is fully translated and playable with a script edited to make sure the player has the hints that any normal person would need vs. the lack of decent hints that the poor Japanese kids had to deal with. There are no abbreviations on any items or equipment, just expanded item names with either squishy tiles or icons. 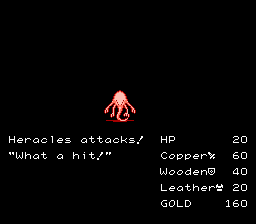 Along with the translated ROM, a fully translated manual with text inserted back into the scans of the actual manual is available on the DvD Translations website. Requires the use of ROM Expander Pro to expand the ROM before the IPS patch is applied. This original game was released with 2 slightly different UxROM mapper chips in ‘87 and ‘88. The same patch works for both of them. Rev B is simply a hacking change. It modifies the hack so that the game can be played on real hardware and on modern emulators. Even with all that, only serious RPG players need apply. This is real old school stuff, and not for the casual crowd Nintendo was marketing GoH 5 to. But, if you like the old ones, this might just be the game you are looking for. Patch modifies both known versions of the game to make the same patched game.